Why do we Forget so Easily? The Commonwealth Games were an international embarrassment for India. The public seems to have forgotten. One thing you can’t complain about in India is a lack of exciting news. So frenetic is the pace of new crises and scandals that it’s easy to forget cases that until only recently were at the forefront of the public’s mind. Take the Commonwealth Games scandal, for example. It was only a bit more than a year back that all of India was consumed by the incredible horror stories of corruption, delay and organizational disaster that marked the Games. Of course, over the last year, a clutch of high-profile arrests have been made over the scandal. But is it enough? Last month, I went to Jawaharlal Nehru Stadium, Delhi’s biggest, to watch a soccer match between India and the German club Bayern Munich. The stadium was the venue for the Commonwealth Games’ opening and closing ceremonies – and, from our first step in, the scope of the muck that surrounded the Games flooded back. Big sporting events like the Commonwealth Games are supposed to build infrastructural capacity, and give a fillip to sports in India. But, one look at the stadium – which apparently underwent a whopping Rs 1,000 crore makeover ($200 million) – was enough to make me enraged all over again. On the lawns outside there wasn’t a single blade of healthy grass, flower beds were empty, and inside, seats were downright filthy and uncared for. 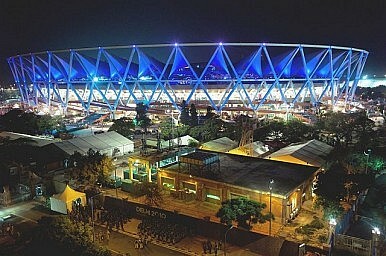 If this was happening to the main venue of the Games, I wondered how other sites were holding up. Last week, I finally managed to drive down to the Games Village that was built on the banks of the Yamuna River in east Delhi. A clutch of half a dozen or so high-rise apartment towers, this accommodation had shamed India in the run-up to the election when foreign news crews had shown – just weeks before the Games in October 2010 – how poorly constructed and appointed these dwellings were. Some 16 months later, things are, if possible, even worse. What could have been prime property and a buzzing new neighborhood lies deserted and already crumbling. Ironically, on February 29, President of the Indian Olympic Committee Suresh Kalmadi – who got bail in January this year after spending nine months in jail on corruption charges relating to the Commonwealth Games – attended a parliamentary committee meeting on why India’s Light Combat Aircraft project delayed. I don’t begrudge our judicial process, or Kalmadi’s right to attend to business as usual if he’s been granted bail. Clearly, he’s not the only one responsible for our Games debacle. Yet, I couldn’t shake off the feeling that we forget (and forgive?) too easily. Sometimes, isn’t keeping the anger fresh and simmering a more noble citizen duty? A recent stay in New Delhi is a reminder of how rife with corruption India is. And how bad things are getting for women.